If you endured (or enjoyed, depending on your taste in movies) the recent Hollywood remake of Conan the Barbarian, you’ll probably not be too hot for a ton more blood ‘n’ guts on the slots reels. If you fall into that latter camp, however, and get all moist at the thought of overgrown men marauding across barren landscapes hacking and slicing their way through villages of peasants, you’ll enjoy Amaya's take on the story of the beefy warrior. But if you loved the original movie from back in the day then you might be slightly disappointed to see that our friend Arnold Schwarzenegger does not appear on the reels. 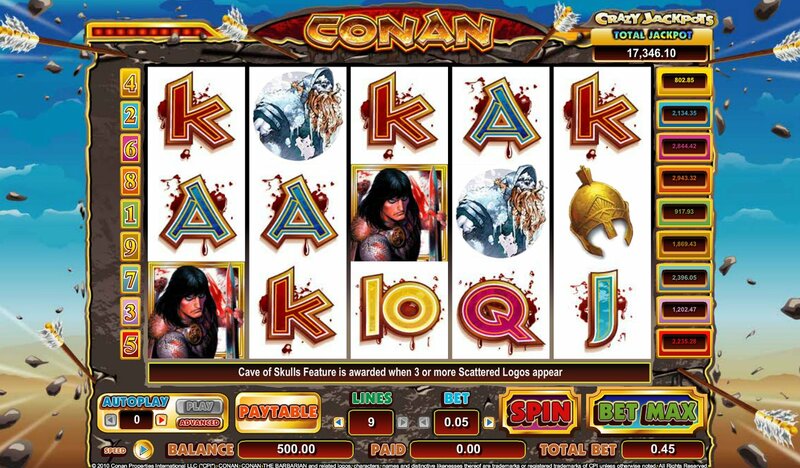 Conan is a 5-reel, 9-payline online slot with betting ranging from $0.05 to $5.00 a coin, as with many of Amaya’s current online crop. The reel symbols are soaked in more blood than a (very graphic) fantasy graphic novel with the 10-through-Ace poker card symbols looking very bloody indeed. Mixing it up on the reels are Conan himself – who launches into sword-wielding heroics when he forms a winning combo – and various icons like a gold helmet, a nubile slave girl, a sorcerer and a demonic bad guy. The Wild is our sword-toting buddy, Conan, who substitutes for all symbols other than the Scatters. Five Wilds across the reels awards a ‘Crazy Jackpot’ (look out for the running total on the main screen). There are 9 Crazy Jackpots, one for each payline. Depending on what payline you hit five Wilds on you’ll be paid out accordingly. Three or more Conan logo symbols triggers the main Cave of Skulls Bonus feature. You can probably guess by the name of the bonus that it’s a fairly straightforward Pick ‘em Bonus round – featuring skulls! Just keep selecting skulls to reveal cash prizes; hit a trap and you turn ends, spinning you back to the main game screen. The round is fairly basic but it’s a nice touch with Conan swinging his over-sized sword at skulls and smashing them to bits. One Pick ‘em Bonus does not an online slot make, and although I found the feature to trigger quite a lot you really have to hit the five Wilds – and the Crazy Jackpots – to make any serious cash at all. Other than the Wilds, the best payout is in five evil Wizards which pays a relatively paltry 750 coins. 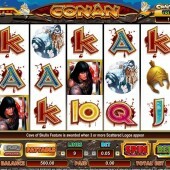 Conan is a good choice of theme for a slot game and I am a little surprised it hasn't been done before. Saying that though, this slot is really just for the jackpot hunters out there as the Pick'em bonuses in the feature are pretty derisory. Personally, if you are into a bit of blood and gore, then I would suggest something like WMS' Spartacus slot or the equally macho Gladiator slot from Playtech.